Needle cast is a common and serious fungal needle disease of spruce trees. There are two types of needle cast: Rhizosphaera and Stigminia. Colorado blue spruce trees are the most severely affected. Native white spruces and its variant Black Hills spruce are more resistant but can also be infected. Norway spruce are seldom affected. New immature needles can be infected in May and June, although symptoms do not show up until late fall or the following spring. 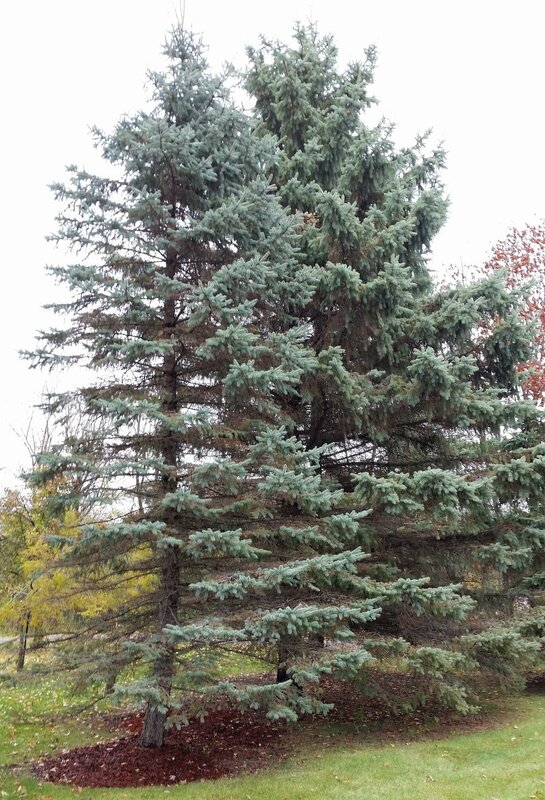 These symptoms include needles turning purple-brown in color and eventually dropping off, causing general thinning of the lower third or half of the spruce. These branches eventually thin, leaving only the current year’s needles on the branch (normally spruces hold 5-7 years worth of needles on branches). These affected branches eventually die leaving a thin, unattractive spruce tree. Positive identification of Needle cast is made using a small hand lens. The appearance of small black dots, fungal fruiting bodies in place of the healthy white dots (stomata), indicate the presence of needle cast. Shadywood Tree Experts can help maintain your trees with the proper disease diagnosis and the use of systemic and/or contact fungicide spray applications and annual fertilization. When you sign up for plant health care from Shadywood, we administer the recommended protocols for disease prevention control to keep your trees healthy. With each visit, our arborists assess trees for overall health. Water trees regularly using a hose or small sprinkler for at least an hour every one to two weeks if there has not been adequate rainfall. Avoid spraying needles with sprinklers as excessive moisture can make fungal diseases worse. Mulch root systems when possible, using natural wood chips to protect the trunk, condition and improve the soil, and to conserve soil moisture. If you see anything that doesn’t look right, have your trees inspected by one of Shadywood Tree Experts International Society of Arboriculture Certified Arborists.